Wirop Industrial Co., Ltd. was established in 1979 and was the first company to manufacture the swaging machine in Taiwan. Wirop Industrial Co., Ltd. is located at Kaohsiung, also known for its harbor in southern Taiwan. Ever since then, with every single solid step in developing innovative products and continuously integrating the quality, Wirop Industrial Co., Ltd. always aims to achieve the guiding principle "ZERO DEFECTS, STRIVING TO BE THE BEST". The products coupled with the spirit of the guiding principle are established to the market. Today, Wirop Industrial Co., Ltd. with exceptional experiences in the industry, is proudly supplying its machines, related equipment, and accessories to more than one thousand clients in more than 80 countries. ▼ Hydraulic Swaging Machine : capacity 15 ton ~ 4000 ton and above. ▼ Horizontal Tension Testing Bench : capacity 25 ton ~ 3000 ton and above. ▼ Hydraulic Wire Rope Cutting Machine, Annealing and Tapering Machine, Winding Machine, and Recoiling Machine. ▼ Auto-Measuring and Cutting Machine. ▼ EN13411-3 (DIN 3093) Aluminum Ferrules : size range from #1 to #S128. ▼ Flemish Eye Steel Sleeves : size range from #1/4" to #6". ▼ SEEE Pre-Tension System, Ground Anchor Stay Cable System (Tie Cables, Bridge Cables, and Structural Cables). Most importantly, we retain favorable customer feedbacks and recognition both at home and abroad. We are proud of ourselves in servicing our customers and those of the industry. Wirop Industrial Co., Ltd. rose founding in southern Taiwan. Making the first swaging machine and dies in Taiwan. Established the first production line of container seals. Company was relocating to Fongshan, Kaohsiung. Established the production line for tibles, structural cables, and tie cables. Our high quality products and the excellence in exporting business were proudly being awarded the Golden Dragon Awards for excellence recognition. Our excellence in quality products was proudly being awarded the Golden Global Award. The beginning of Pingtung plant operation and had the quality approval of ISO 9002. The Lloyd’s Register Quality Assurance awarded. Wirop Industrial Co., Ltd. has become a member of AWRF. Co-operating with Japan SEC. Establishing the production line of SEEE pre-tension system, tie-cable, tible, and structural cables. Production of the first 3000T Hydraulic Swaging Machine. Production of 2000T Horizontal Tension Testing Bench with overall length 100 mtrs. Kaohsiung expansion plant began operation. Complete testing and production of Flemish Eye Steel Sleeves #6’’. Formal testing on Vertical Dynamic Testing Bench. Enhance the product quality by the production of Flemish Eye Steel Sleeves wholly inside Wirop. Production of the first 4000T Hydraulic Swaging Machine. The lab has proudly certified by TAF (Taiwan Accreditation Foundation, conforms to ISO/IEC 17025). Wirop Industrial Co., Ltd. has serviced more than one thousand clients in over 80 countries. Complete production of 3000T Horizontal Tension Testing Bench with overall length 109 mtrs. New factory completed for pre-tension products and seal business. Complete production of 3000T Horizontal Tension Testing Bench with overall length 100 mtrs. New subsidiary company for European marketing, Wirop Europe GmbH, is established. Opening ceremony of new facility (named Chainson Industrial Co, Ltd.) for structural cable department is held on 20 January 2016. 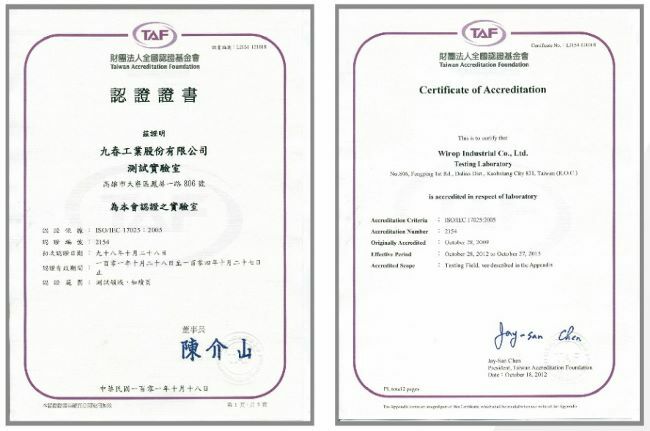 ▼ WIROP® Research and Development team is equipped with a lab proudly certified by TAF (Taiwan Accreditation Foundation, conforms to ISO/IEC 17025). 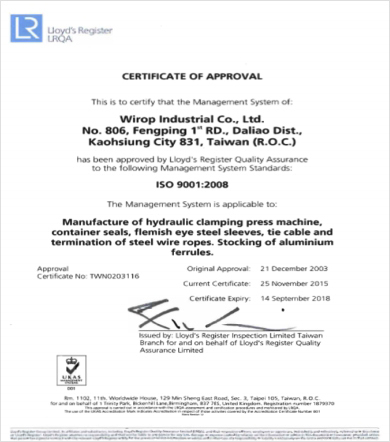 ▼ WIROP® has been recognized by the Lloyd's Register Quality Assurance, the certificate of Quality Management System. We adopt modern and efficient 3D simulation and FEM analysis to minimize errors and produce a stable solution. ▼ Dedicating efforts to technical innovations for providing the needs of wire rope fabricators. ▼ Our lab has equipped with testing benches : (1) Dynamic Fatigue Vertical 100T Testing Machine. ▼ "Only the paranoid survive." Wirop Industrial Co., Ltd. has implemented extremely strict quality control into practice at every stage of manufacturing process. The quality control is approved by ISO 9001:2008. ▼ Detailed testing on products and equipment before dispatch and shipping. 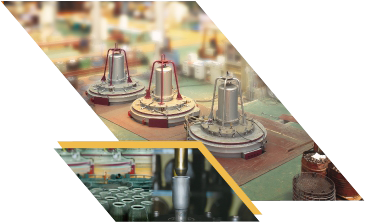 Insure product quality through every stage of the manufacturing process. ▼ Crystal inspection on Carbon Steel and Aluminum Sample. ▼ Strictly follow EN 13411-3 standard. Setting 15% ~ 30% of maximum load capacity and testing the dynamic endurance on sleeves and wire ropes 75,000 times. Record the maximum breaking load according to EN 13411-3 standard. ▼ Testing bridge cables and container seals according to customer's request.